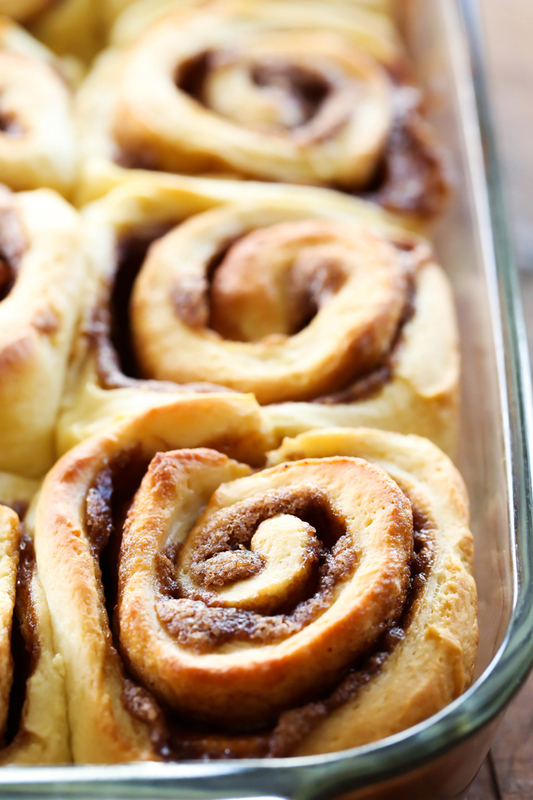 These cinnamon rolls are absolutely DELICIOUS and perfect for the holidays! The bread is soft and they are ooey gooey perfection. The Eggnog Frosting on top is absolutely heavenly and a fantastic addition to the rolls! The holidays are upon us which means so is EGGNOG! HOWEVER, when baking with eggnog, I actually quite like the flavor. 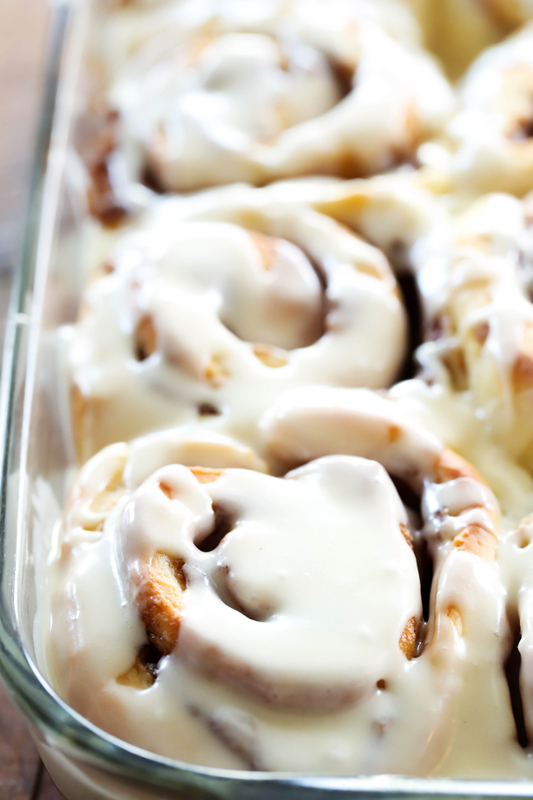 These cinnamon rolls are the perfect amount of eggnog. They are ooey and gooey and the bread dough is so soft and absolutely delightful. I was seriously “ooooing” and “aweing” with every single bite! 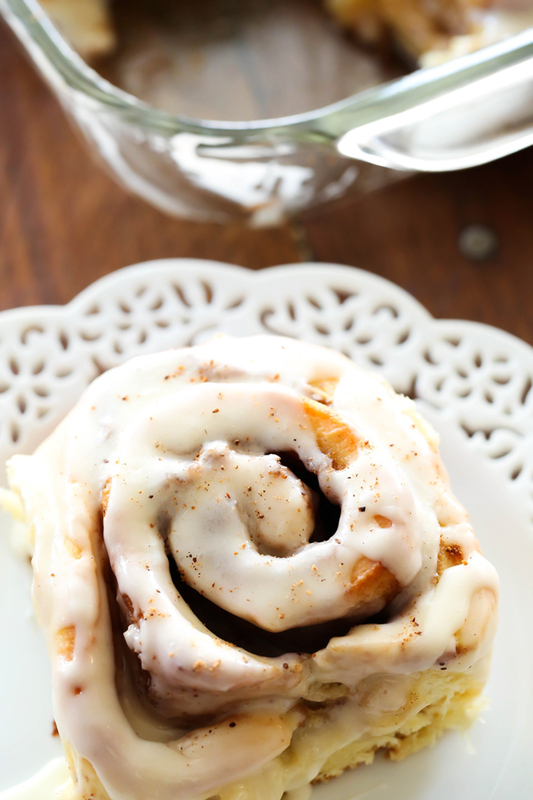 So if you are looking for a delicious holiday cinnamon roll, give these a try! They are sure to be a hit! In a large stand mixer, place sugar, butter, salt, and egg and mix with the paddle attachment. Add eggnog mixture and blend on low speed. Change to the dough hook and add the flour in a cup at a time until dough takes its shape. Mix well. (dough should be slightly sticky, with an emphasis on slightly). Spray a medium size mixing bowl with vegetable spray and place dough on the bottom. Cover with plastic wrap. Allow to double in bulk, about 2-3 hours, and then dump onto a flat working surface, slightly covered in flour. While dough is raising combine all filling ingredients together in a small bowl and mix well. Set aside. Preheat oven to 370 degrees F. Kneed dough for about one minute. Roll dough into a 10" x 14" rectangle. Spread filling over dough to cover the entire surface. Roll dough lengthwise to make a long log. Cut into 12 slices and place in a 9x13 baking dish. Bake at 370 degrees F for 18 to 22 minutes. Combine glaze ingredients and pour over warm rolls. I haven't seen such version of cinnamon rolls before! They look and sound gorgeous! You know the holidays are here when you see a lot of eggnog recipes around. I love the idea of eggnog on cinnamon rolls. Heavenly stuff. And yeah, I totally agree - Dorothy is awesome. I love eggnog and cinnamon rolls. Perfect combo! Made these yesterday with leftover eggnog and they were absolutely delicious! I've been testing cinnamon roll recipes lately and both kids said these were the best of all I've made. Perfect eggnog flavor, not too strong, but its there. Great texture and still good warmed up the next day. I did use bread machine and it worked fine.